Tools and torque solutions by STAHLWILLE are an established feature in the aerospace industry. Their storage and transport solutions are equally prevalent. There is hardly an international airline worldwide that does not opt for STAHLWILLE products. One key reason for this is that this specialist for torque tools has known the industry from the inside for decades and offers aerospace operations innovative solutions that guarantee efficiency and safety even in busy environments such as hangars. The latest solutions provided in line with this tradition are the Reading Station DAPTIQ® and the Tool Trolley 95 VA DAPTIQ®, and these will be available on the STAHLWILLE stand in Farnborough for visitors to see. With the aid of RFID technology, they enable companies to implement safe, efficient completeness checks. The Tool Trolley is simply pushed into the Reading Station and the station reliably identifies all the tools tagged with RFID chips. 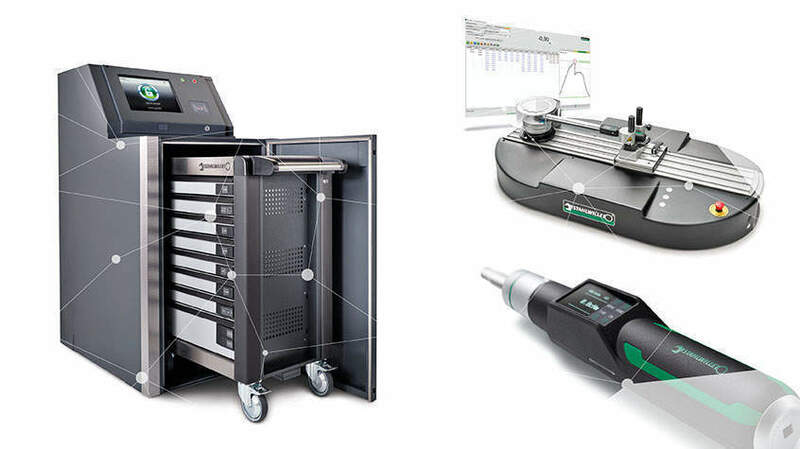 The results of the check can be transmitted directly to the ERP or warehouse management system for a completeness comparison – because the Reading Station is designed for connectivity and integration. It is able to read out hundreds of tools in the shortest conceivable time. Thanks to the use of RFID technology, the kit layout can be easily modified at any time. And last but not least, a customer only needs to invest in one Reading Station and it can then be used with every DAPTIQ® storage solution. Another notable highlight at the Farnborough show is the brand new TORSIOTRONIC®, which is the first electromechanical torque screwdriver in the world. This compact torque tool has already been honoured with the Red Dot Award and combines the benefits of digital technology with a mechanical trigger mechanism. When the target torque has been reached, the TORSIOTRONIC® screwdriver gives the user an unmistakeable tactile “click” signal. It is capable of storing no less than 2500 tightening jobs and sequences. All the measurements can be transferred to the PC later via the micro USB port. There are also new developments in connection with ISO 6789:2017: STAHLWILLE supplies all its new torque tools in compliance with the new standard, and are one of the first manufacturers to do so. At the same time, the company will be presenting its perfectControl fully automated calibration unit and TORKMASTER 5 software – a complete package that enables calibration laboratories to work efficiently and quickly despite the far more complex testing and calibrating requirements of ISO 6789:2017. STAHLWILLE at the Farnborough International Airshow: Hall 2, Stand 2420.